The above painting is one I have done for a friend of mine. This is her half Halflinger mare, Lilly Mae. 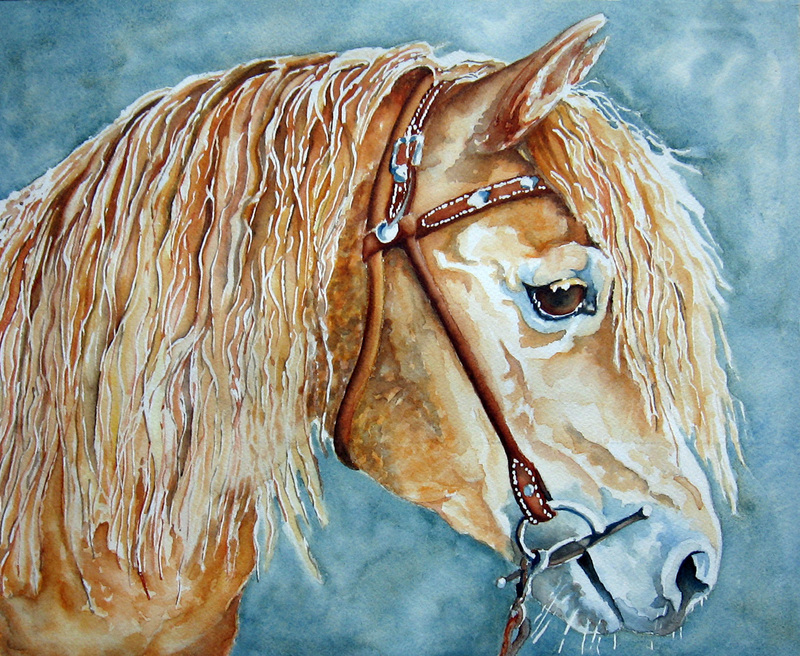 I used frisket for the white strands of mane and whiskers and highlights on the eye and the hardware and stitches on the bridle. After painting strands of mane in for hours!, I had to do some lifting with a sponge to blend some of the lighter colors. Her mane is lighter than her body, but not white. I worked extra hard on sculpting her face and capturing the veins and the jawline to lead the viewer’s eye to Lilly’s huge soft dark eye. That took several layers of very light washes. After removing the frisket from the metal hardware of the bridle, I went back in and shaded areas of it. I used Harvest Gold, Raw Sienna, Halloween Orange, Copper Kettle, Burnt Umber, Sepia, Prussian Blue and Blue Stone to create this portrait. Thankyou to those of you that have enquired as to my whereabouts. I have been fine, but the Holidays and all the shoveling and blowing of snow that I’ve done has kept me away from painting and blogging. I will try to be more present!